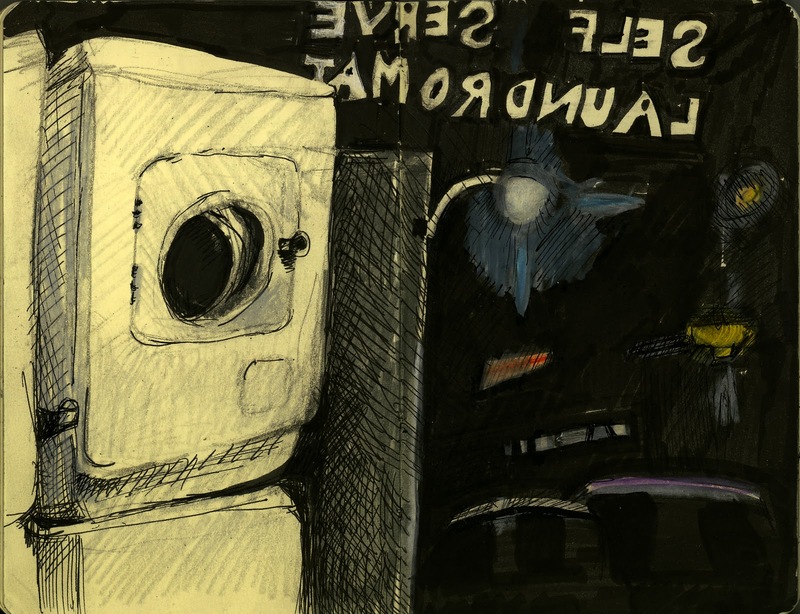 I'm picking up from Barbara Week's post: Drawing in the Dark. I love to draw the night. Seeing what you're doing is really a challenge. It feels kind of crazy, like driving without headlights. 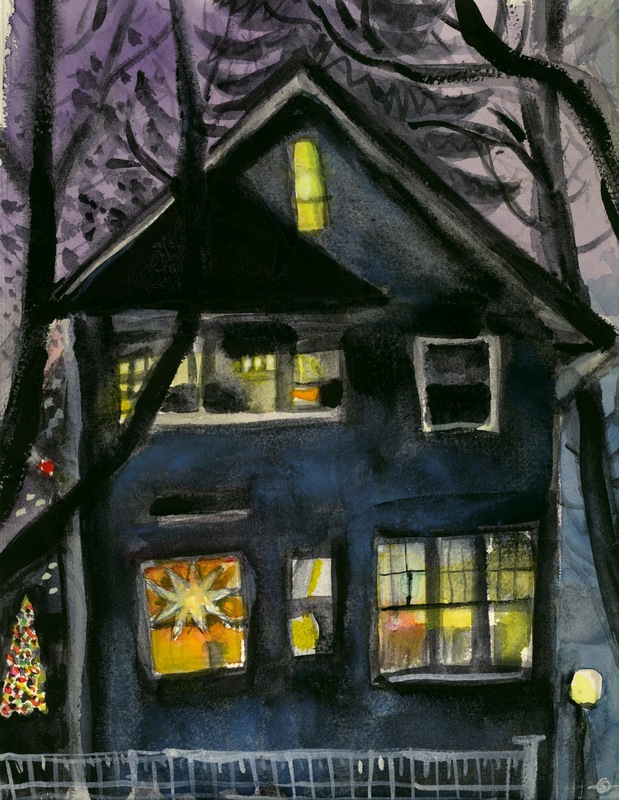 Drawing the darkness outside from inside when it's winter is particularly difficult. Any light used to illuminate the page and the palette causes reflection, making it difficult to see out. "Back Door Light", a Neocolor II, was done a few nights later, looking out another second floor window to my side neighbor. No moonlight, only the illumination from under the door overhang and the reflection off a more distant house as seen through the silhouetted trees. I really got eye strain from doing this one and all my crayons ended up on the floor. It was hard to keep it all together, working in the dark. 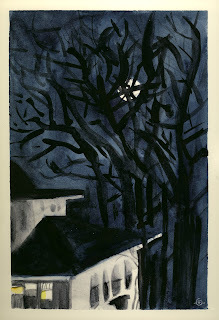 "Moonlight from Lapa" was done on the first night I was in Lisbon for the Urban Sketchers Symposium this past July. We were staying in a flat on the top floor of a building that was on one of Lisbon's many hills looking out over the Tejo River. There were no screens on the windows (therefore no reflection to contend with) and the moon cast more than enough light to see. This night sketch was a cinch. This was done at a laundromat in downtown Cedar Falls for an Urban Sketchers Theme of the Week. Inside was bright. 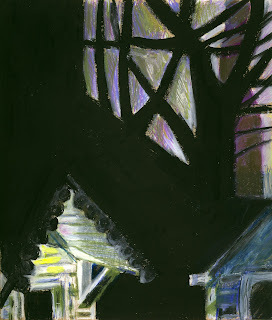 What was outside was unclear--I drew what I saw, but it came across as an almost abstract smattering of lit shapes and colors. 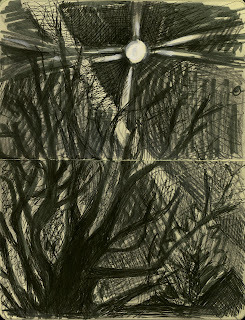 From my bedroom window, I drew in the dark, hardly able to see what I was putting on the page for "Moonrise and Contrail". When I turned on the light to look, I added white to the moon and its rays. This was my first drawing of the night. It was 1977, I was backpacking in Crete with a friend. We were sleeping out in the Samaria Gorge. The moon was SO bright. I was too scared to sleep; we were told there were scorpions. 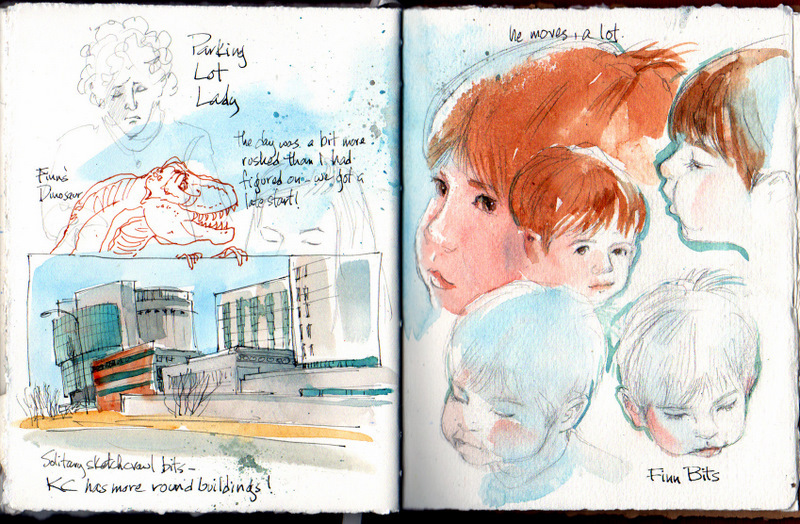 I sketched a lot on this trip. I had only one drawing tool: a technical pen with black ink. If you'd like to see a few more here's Moonrise over Waterloo, House Across Clay Street, and a twilight cityscape of Portland, Oregon, when I attended the 1st Urban Symposium, July 2010. 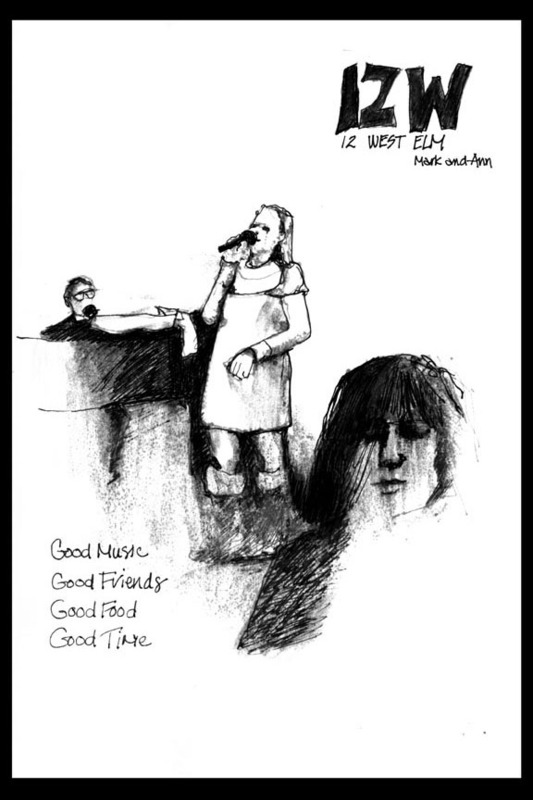 The Elms Hotel's had a lot of of owners over the years, even in my memory--I've lived nearby since the late 60s. The latest is doing MAJOR renovation, and we got to go tour the demolition phase for our sketchcrawl. It was amazing, and the plan is to be open again for business in April! It's pretty much down to bare stone and brick walls in a lot of areas, so I hope to have another tour when it's a little farther along. They're expecting a LOT of construction crews on hand starting this week. This was the view I chose, though I wish we'd had more time in the catacombs! 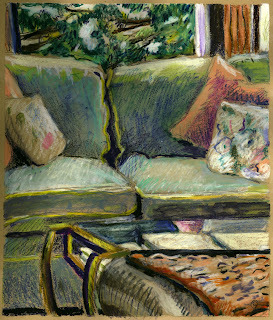 The broad window ledges made a handy sketching table. We were SO fetching in our hard hats...but rules is rules...and OSHA Rules! 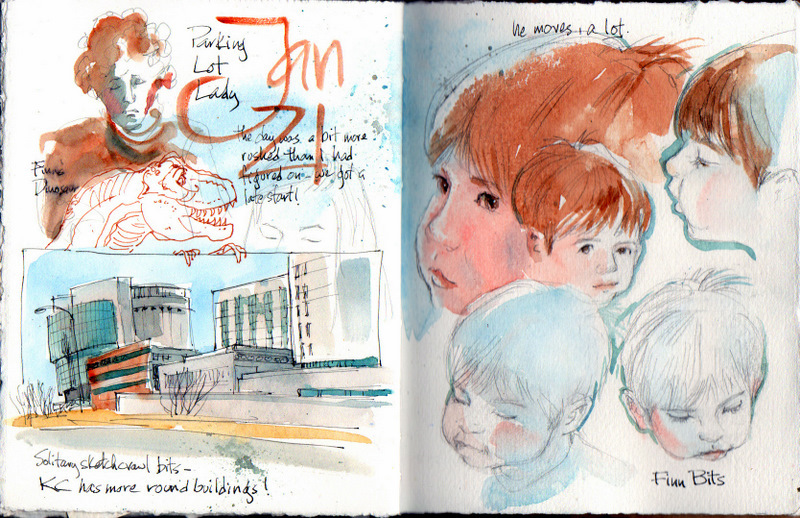 All in all it was a terrific sketchcrawl, even if there WERE only four of us this time. Thank you, Keith Winge and Bari Allen for letting us explore, and for the folks at Ventana for taking such good care of us! 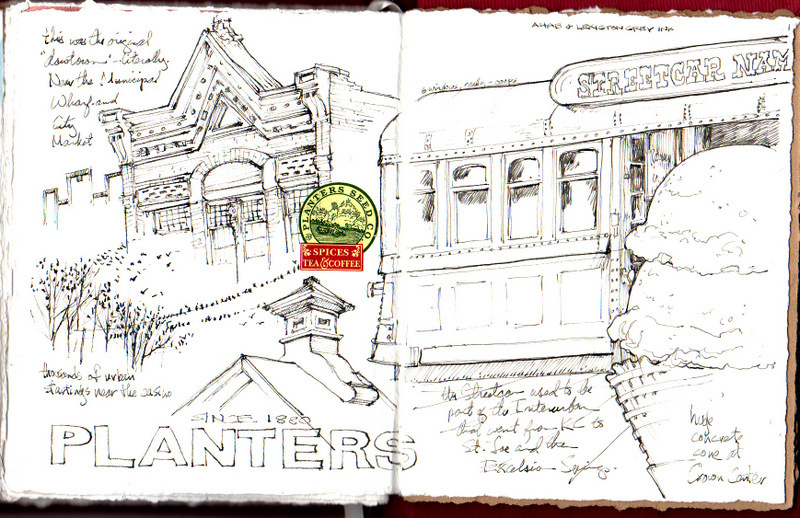 You can find a few more photos on our parent blog, Urban Sketchers, HERE. Ink and watercolor on tan paper, with just a bit of white Prismacolor pencil. A friend of mine, who is a theater critic, has learned to write in the dark. She tells me it takes a lot of practice. 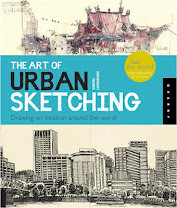 It seems so does drawing. 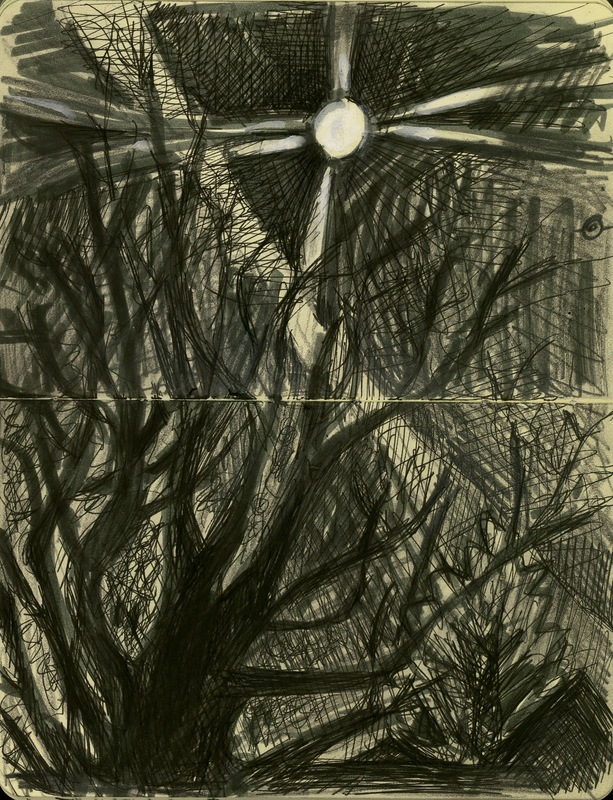 I'll have to come back here often to work on drawing, as well as dancing, in the dark! Chicago has many neighborhood store-front theaters and music venues. This one, 12W, is pretty new. I hope it sticks around! Downtown...to add color or no...? 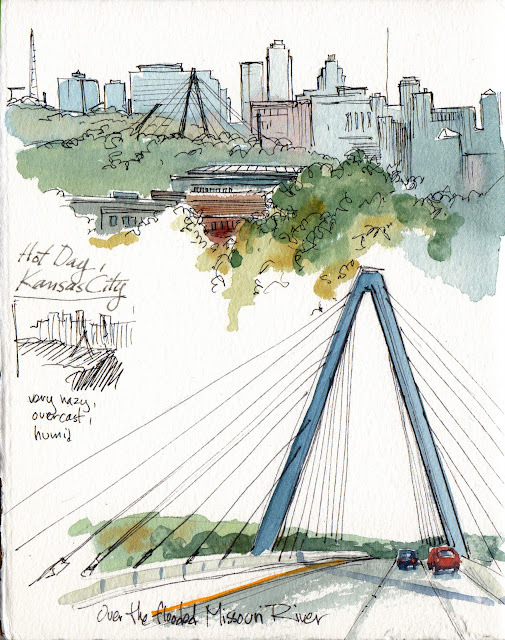 Joseph and I made a sketch trip to Kansas City the other day...he needed star anise for his Chinese 5-spice, I needed sketch time, so we invaded Planters Seed to inhale, browse, and shop, and then sat in the car so I could sketch the old buildings at the City Market. I love this area, the original downtown, near the City Wharf. Much traffic on the Missouri River, once upon a time, and barges still bring in this and that. So. I sketched madly with my Noodler's Ahab pen and Lexington Grey ink, intending to add color, later. But...maybe not! 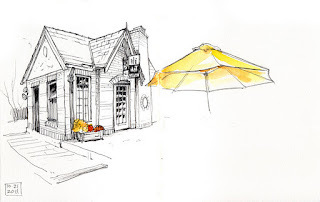 (54) urban sketch - The Spice Merchant, a photo by vickylw on Flickr. I went here yesterday to buy some tea . . . . I ended up picking up a few more items, including a blueberry-filled chocolate bar from Germany. Yum! This old Spanish-style building was built in 1909 to house the Mentholatum Company's headquarters and factory. 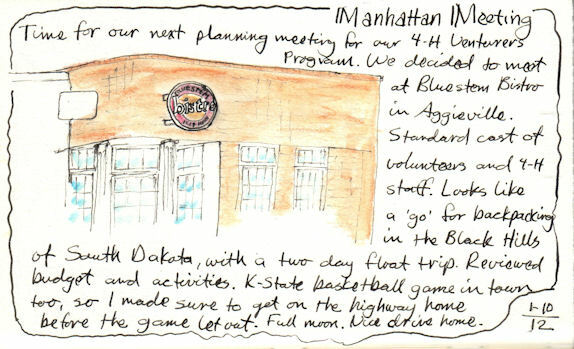 (Mentholatum was invented in Wichita in 1894.) Sometime later, after the company left Wichita, Louise Brooks, a former silent film star, ran a dance studio here. Now it is home to The Spice Merchant, a gourmet coffee roaster --- even though I don't like drinking coffee, I always love the aromas when they are roasting! And it's a great place to find unique tea blends, spices, and cooking stuff. The entire village of Elsah is nestled in a wooded ravine that is accessed by traveling north on the scenic Great River Road from Alton, IL. Entry to the town is between to two tall limestone bluffs named Mount Radience & Mount Pisgua that overlook the Mississippi River. Picturesque and quaint perfectly describe the architecture and the layout of the historic village. At the end of Valley Drive sits the carpenter gothic style United Methodist Church built in 1874. According to the village web site a “Mrs. Ames donated the small Sunday School Room at the rear of the building.” The sketch-worthy play of light and strong shadows across its facade at mid day caught my eye. 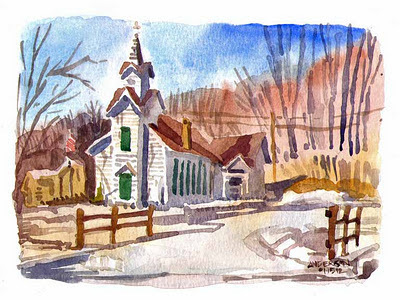 Church, Elsah, IL, 01/15/2012; Michael Anderson, watercolor on Canson 140lb cold press, 7″ x 9″. This is an older sketch of a rather well known landmark- Cloud Gate in Millennium Park. 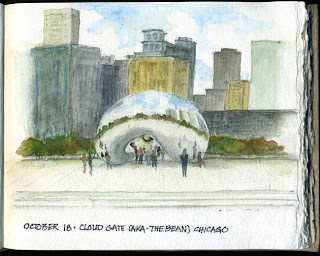 We locals call it the Bean. I figured I'd start out with something familiar but I'm looking forward to posting the many faces of Chicago "one drawing at a time!" Thanks Kate! 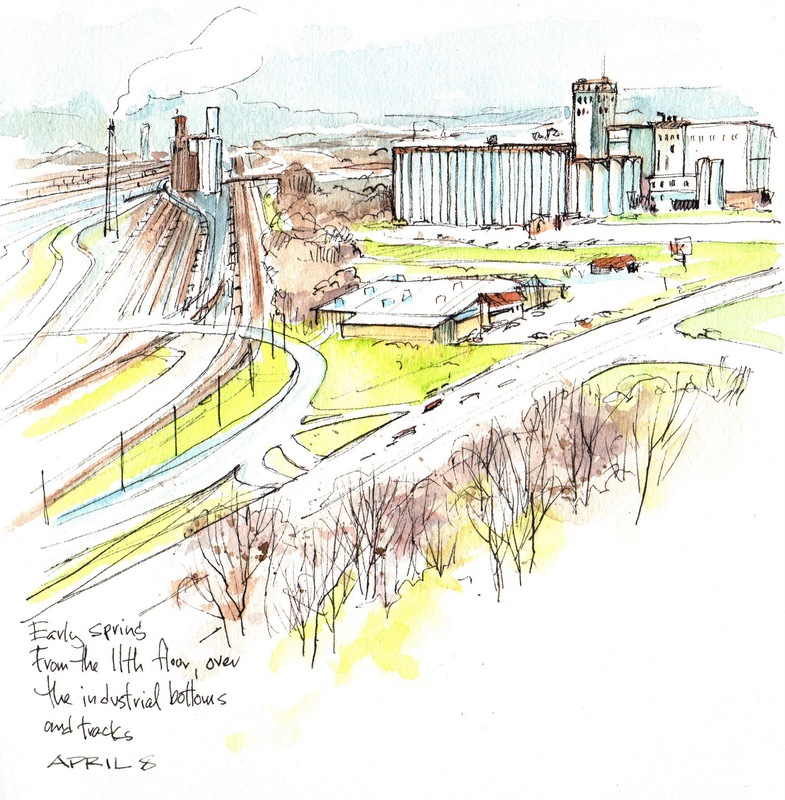 I'm happy to be part of Urban Sketchers Midwest. Or is that Rural Urban? 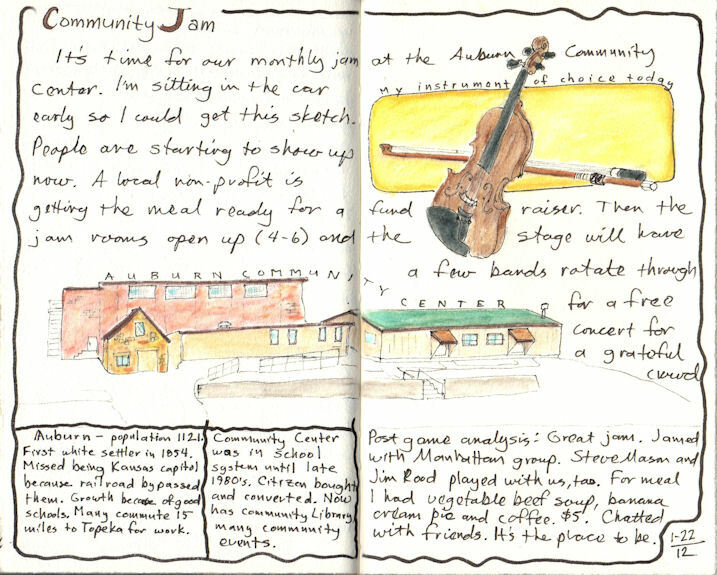 We had our monthly jam at our regular spot, the Auburn Community Center. Auburn has a population of 1121. Our gathering is a big community event to a town that size. The Community Center qualifies as the center of town, so it's Urban to me. The building are quite the collection of various periods of architecture. That's how schools expand over the years. When the schools walked away from the building, an individual bought it all and converted it for community use. We are all grateful he did. It houses their Library now, and many groups have activities there. It feels good to be part of a community. 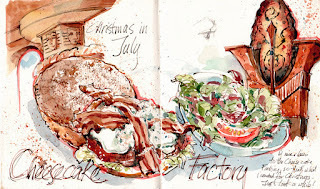 I went early to the jam so I could sketch. 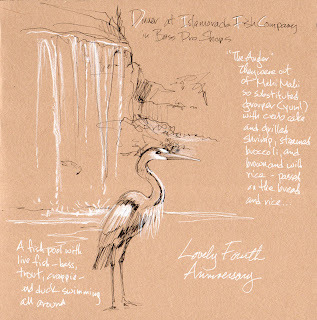 After driving around I found a good spot to sit and sketch. A non-profit group comes to set up a meal they sell as a fund raiser. 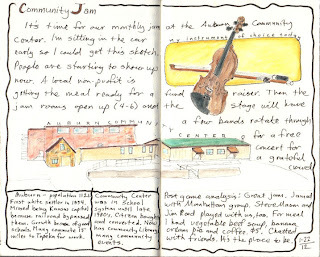 Slowly people come, carrying guitars, fiddles, mandolins, banjos and basses. I finish the top 2/3 of the spread from a picnic table and finish the rest at home. Artist markers, watercolor pencils, waterbrush, Velin Arches text woven. ...and I ended up with a collection of bits and pieces...added color later, at home, from memory. I missed my sketchcrawl pals! 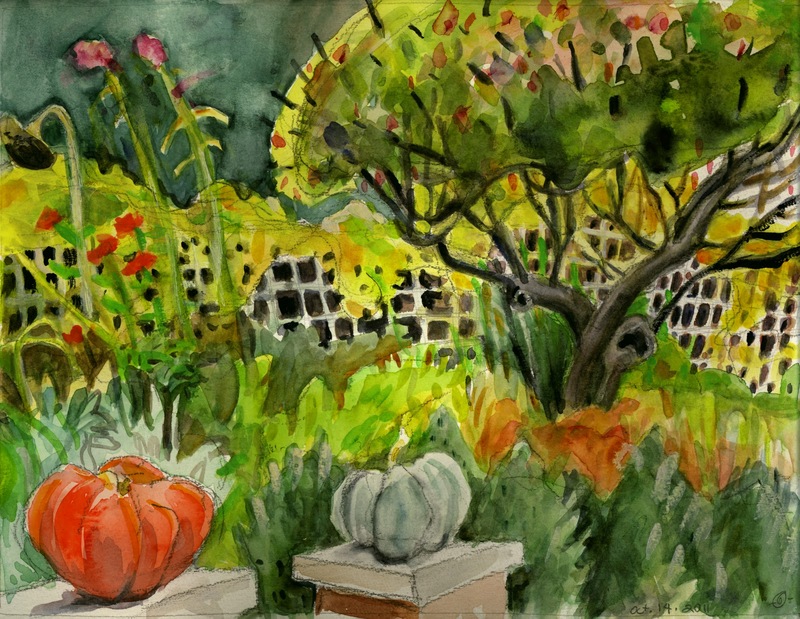 Another sketch from a vacation trip this past October. Washington, D.C. was one of our stops and the White House was one of the must-see places to visit. It is a majestic sight for sure. I had the chance to sit for a bit and sketch this view. The Washington monument can be seen in the background although it is currently closed due to earthquake damage earlier last year. 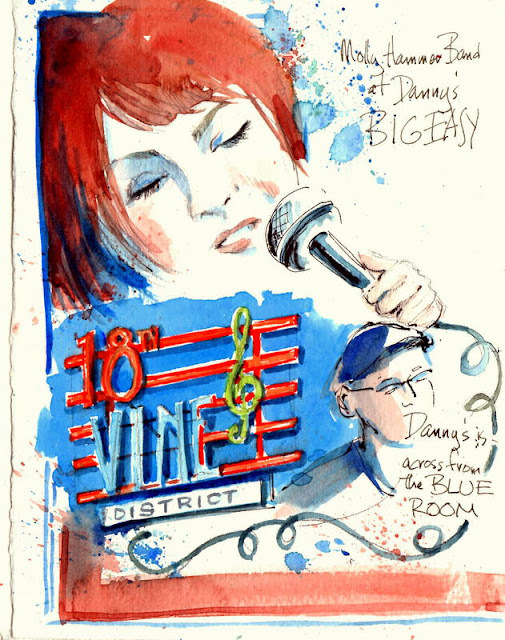 We went into the City Saturday night to hear godchild Molly Hammer rock Kansas City's historic Jazz District! We sat right next to the band at Danny's Big Easy...it was FANTASTIC. Joseph and I even danced, a little. 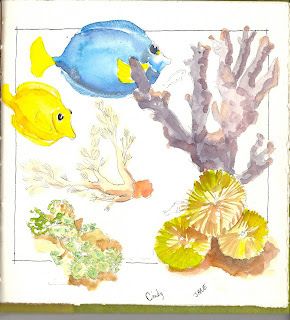 And I sketched like mad, with a colored pencil, ink, and graphite--added color later, from memory. Danny's is right across the street from the American Jazz Museum...so far I'm never there when it's actually OPEN, because I'd love to see it. The famous Blue Room is across the street, too. Another spread on our parent blog, Urban Sketchers...just click the link. Although the tragic events occured more than 100 years prior to the life of Martin Luther King, Jr. it seems appropriate to remember on this day another martyred advocate of freedom, Elijah Lovejoy. Lovejoy, a newspaper publisher and Presbyterian minister, was a champion for freedom of the press and freedom of speech. He was also an outspken abolitionist. Lovejoy was killed by a pro-slavery mob defending his printing press in 1837. The memorial centers on a 93-foot high granite column topped by a 17-foot high winged statue of Victory. 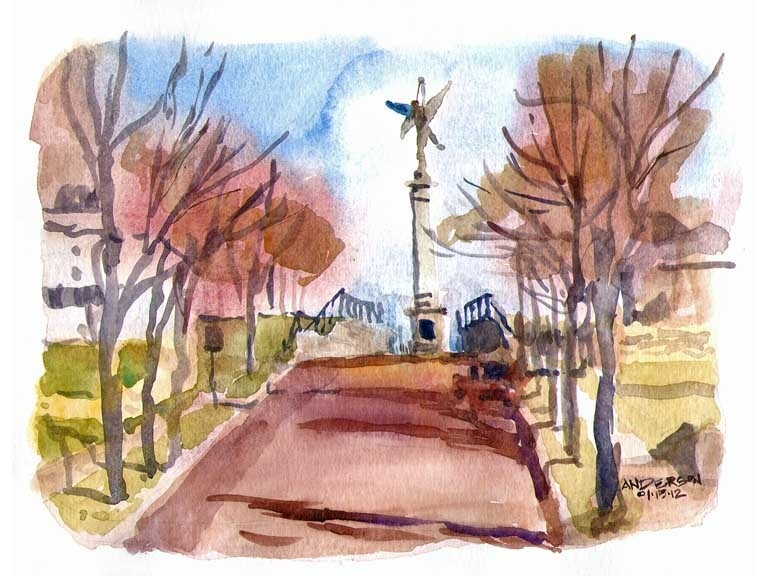 The monument was dedicated November 7, 1897, the sixtieth anniversary of Lovejoy’s death. 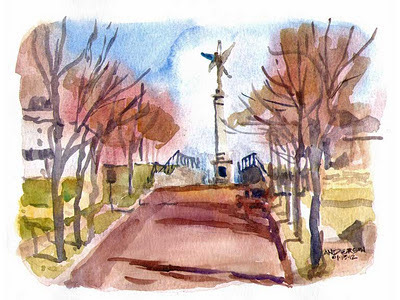 Elijah Lovejoy Monument, 01/15/2012, Michael Anderson, watercolor on Canson 140lb cold press, 6″ x 8″. 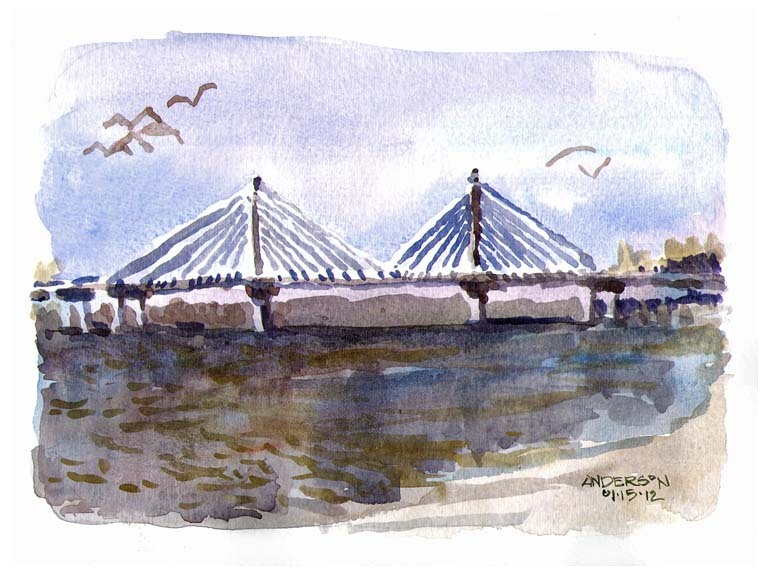 The Clark Bridge links Highways 367 and 67 in Missouri to Alton, Illinois. The cable-stayed bridge is a spectacular engineering achievement that carries four lanes of traffic and two bike lanes across a span of over 4000 feet above the Mississippi River. To my eye it is a sketch-worthy work of art as well. Clark Bridge, 01/15/2012, Michael Anderson, watercolor on Canson 140lb cold press. 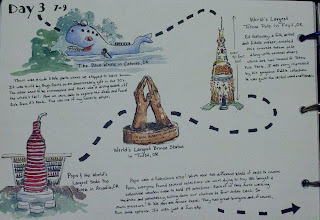 Our family loves to travel and Route 66 is a favorite. We've driven it from the beginning all the way to Santa Monica's end and go back to revisit favorite sights whenever other adventures take us near. I love the curves and sway of the old road and how friendly the people are all along the route. It's like being able to time travel right from our own backyard. sketch crawl, 10.11.07, a photo by vickylw on Flickr. 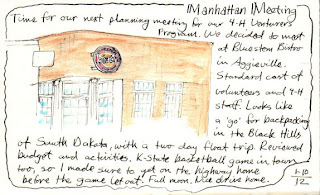 It was my very first sketch crawl, in October 2007, and the first day sketching with Cathy 'Kate' Johnson. This is the back of the Olde English Garden Shoppe in Excelsior Springs, MO, now closed. 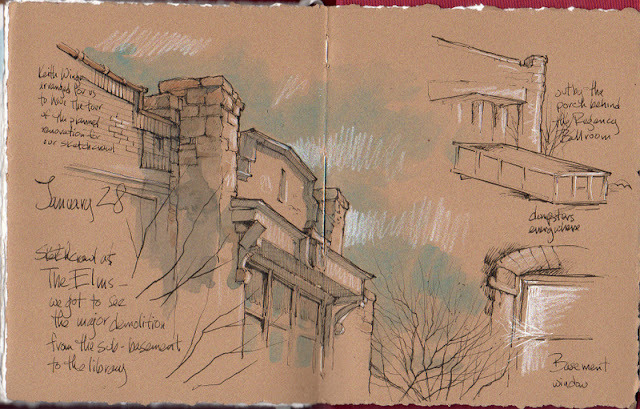 Feeling a bit intimidated about sketching with others, I just drew in pencil on-site, erasing often. Later at home, I did this watercolor version. 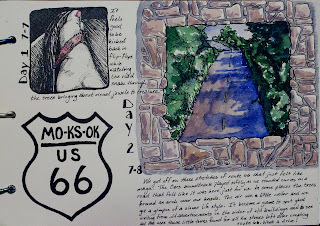 Since then, I'm overcoming my shyness -- now I sketch directly in ink and watercolor any where, any time. Being stretched can be fun. Had a meeting in Manhattan last night. That's the one in Kansas. That other Manhattan won't be in my sights any time soon. It's a meeting of mostly volunteers running a State-wide youth outdoor organization that I've been involved with a few years. I need some sketching time so I get there early just to sketch before the meeting. I discovered that it makes for a very settling shift in mindset. Last weeks record breaking mild temperatures were a bonus. 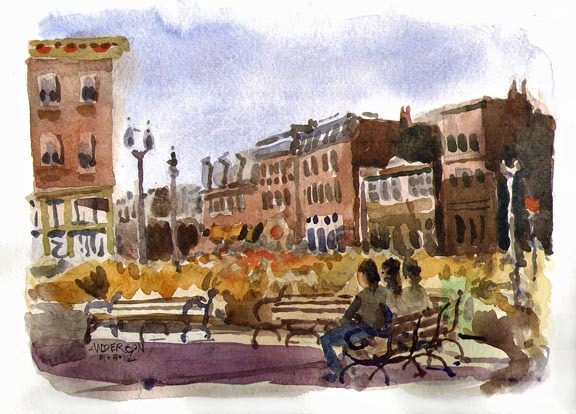 In this sketch three friends enjoy the warm weather while sitting on the benches along Park Avenue during the lunch hour. In the background brick buildings with their mansard roofs form a distant curtain. 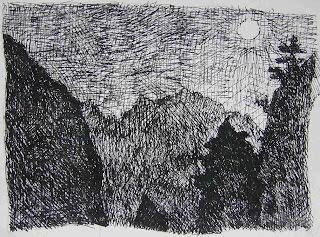 As Robert Henri describes it, "At noonday the landscape is just as fine, just as mysterious and just as significant as it is at twilight." Park Avenue & Vail, 01.05.2012, Michael Anderson, watercolor on Canson 140lb cold press, 6" x 8". http://www.picassoexoticaquatics.com, a new-ish salt water aquarium store. The fish were amazing, but what really caught my attention was all the coral they grow themselves! Late this past October I had the good fortune to make a visit to Fallingwater in southwestern Pennsylvania. For those not familiar, this is probably the best known work of architecture by Frank Lloyd Wright. It was a beautiful fall day with the leaves changing and the stream running fairly fast. 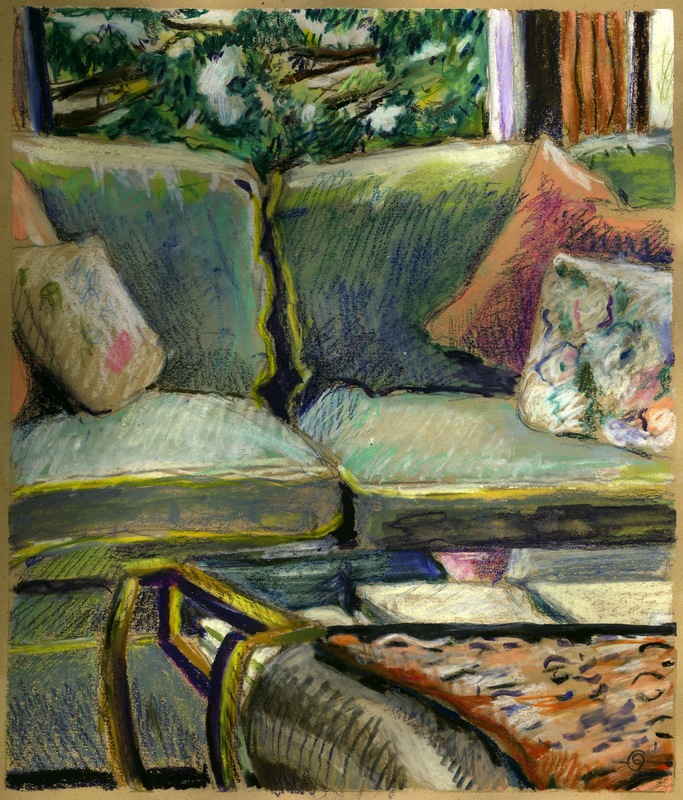 I did my best to sketch this scene and to capture the mood of the day and place. 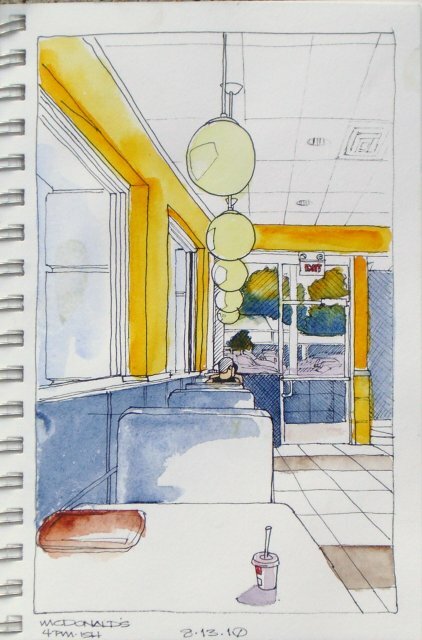 This drawing with bits of watercolor added was done in a small watercolor moleskine. 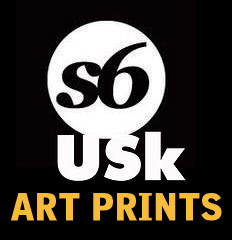 Sketch 'em while you can! 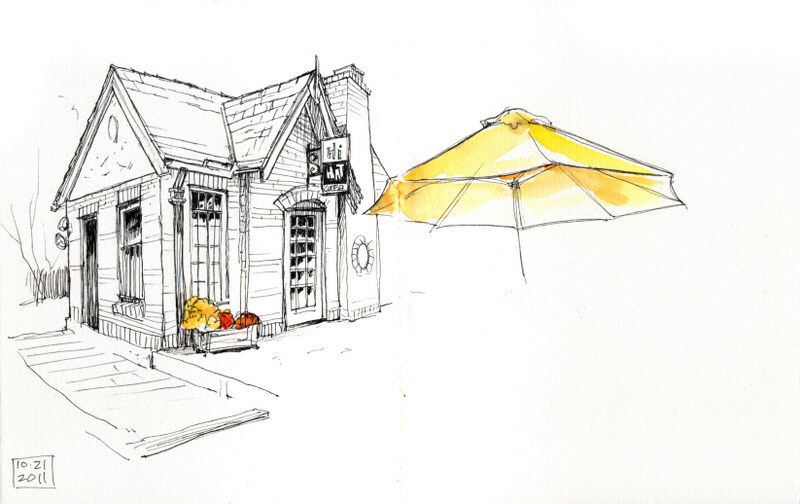 I'm really glad I sketched this cute little building when I did, at our sketchcrawl a few months ago. Due to a BIG urban renewal project in our town, it's now a vacant lot! It looks like a war zone where it was, but there will be a new neighborhood built all down this street. 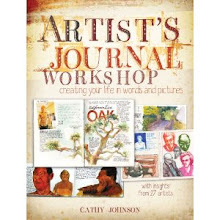 We'll see if I feel like sketching THAT. 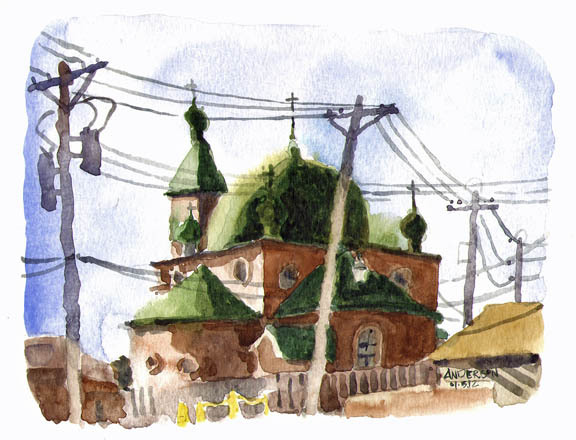 The onion domes of St. Michael’s Russian Orthodox Church on Gravois seemed intriguing subjects to sketch especially when cast in the high relief of the low angle of mid-day winter sun. The view that caught my eye was from the alley behind the church. Fast-food drive thrus, sight proof fencing and utility poles have encroached on the diminutive church but its unique visual character remains intact. St. Michael’s, Michael Anderson, watercolor on Canson 140lb cold press, 6″ x 8″, 2012. 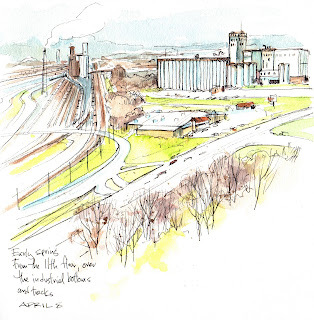 We've just started up our Midwest blog, with the blessings and help of Gabi Campanario, creator of the popular international Urban Sketchers blog. 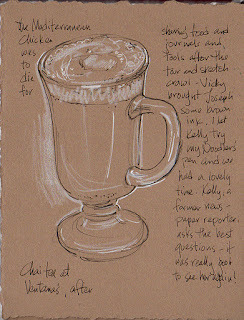 He--and the blog--have been a huge inspiration for all of us who love to sketch, wherever we are. 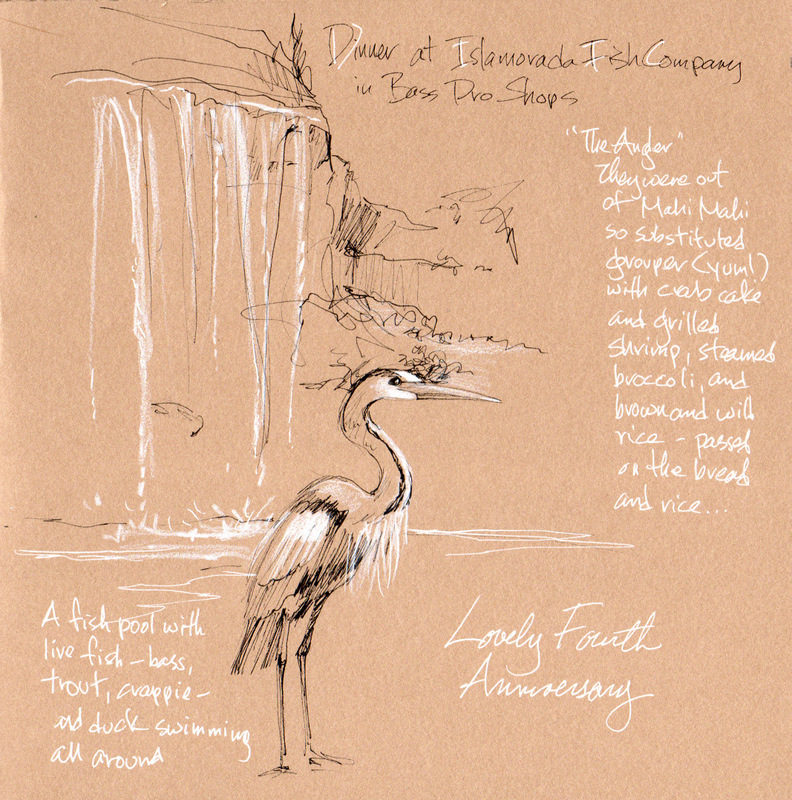 We're delighted to have the chance to show OUR part of the world, one drawing at a time. 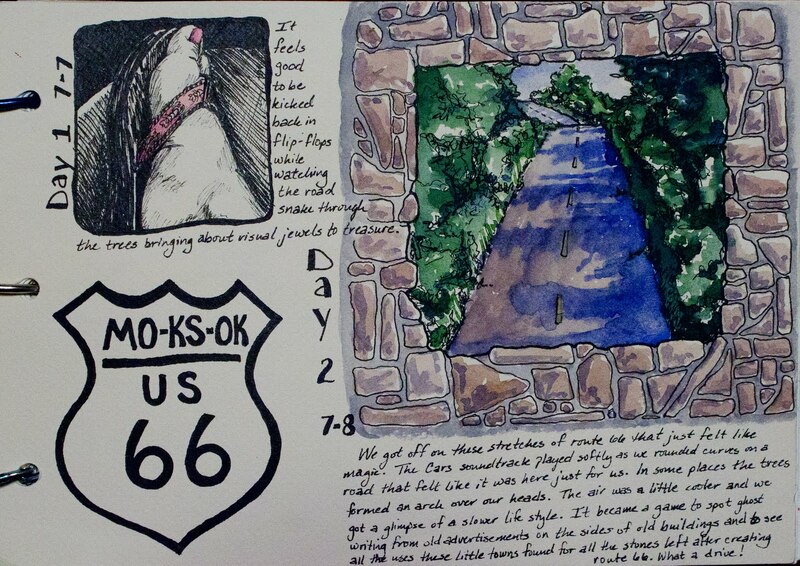 Above are just a few of my own sketches, from our part of the Midwest. You'll see a wide array, so please keep coming back!